Bank of America Merrill Lynch recently came out with its "Transforming World Atlas" research note, which examines global economic trends through a series of maps. One notable map showed which countries had the highest number of operational robots. 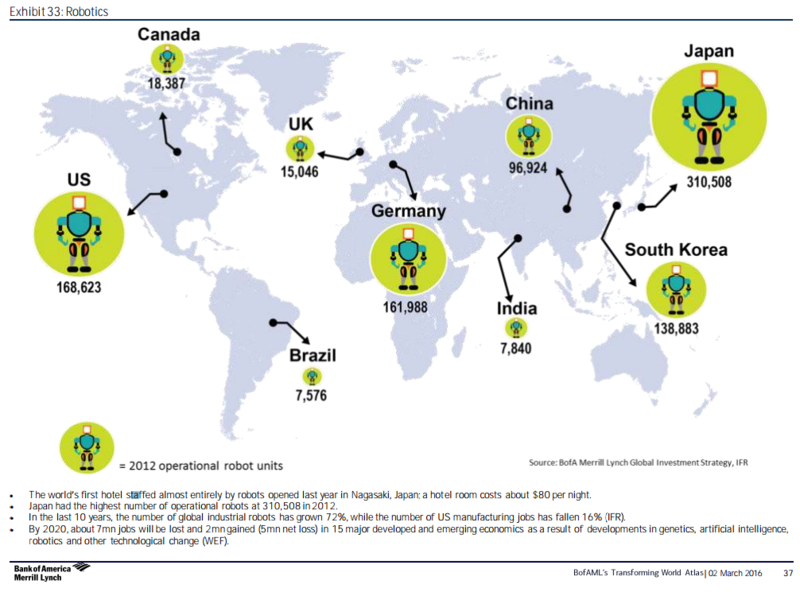 Japan was number one with 310,508 operational robots, according to data from 2012. There's even a hotel staffed almost entirely by robots that opened last year in Nagasaki, Japan, according to BAML. The US is in second place with 168,623 operational robots, and Germany is in third with 161,988, according to 2012 figures. And, naturally, all of this has implications for the global economy going forward. "In the last 10 years, the number of global industrial robots has grown 72%, while the number of US manufacturing jobs has fallen 16%," noted the BAML team, citing data from the International Federation of Robotics. Moreover, "by 2020, about million jobs will be lost and 2 million gained (5 million net loss) in 15 major developed and emerging economics as a result of developments in genetics, artificial intelligence, robotics and other technological change," the team added, citing the World Economic Forum. In any case, check out the map below.